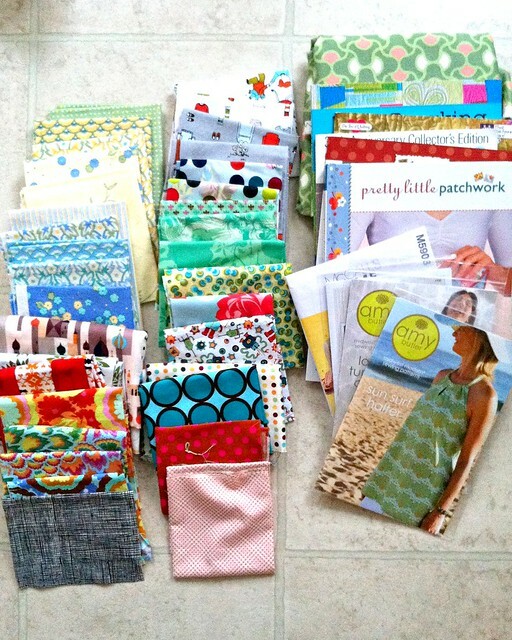 Last month I was super lucky and won the Traveling Stash giveaway from Kelly's blog. 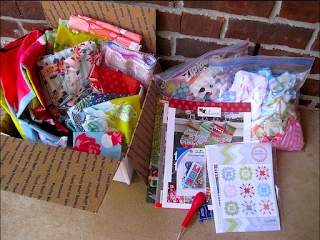 It's a box filled with random fabric, notions, books, etc called the Traveling Stash. You can read more about it here. If you win the box, you can remove whatever you like and add items from your own stash before you pass it along! Here is a picture of what Kelly included. (stolen from her blog. I totally kept the Swoon pattern). But I wasn't really sure what you might want. So I'll finish stuffing the box with some of the FQs once I get an idea of what you are into. To win, just leave one comment: what color are you currently obsessed with? I can't get over coral right now. 3. You must promise to fill the box back up after you have taken out what you'd like to keep! I will leave the giveaway open until 11pm EST on Friday, Jan. 29th. I will have the Random Number Generator choose my winner. Good luck! I love greens and yellow! And aqua! I have totally been stalking the travelling stash. LOL I am totally obsessed with coral/peach right now, too! I have noticed a shortage of purple and yellow in my stash...oops. I just saw this recently, and I think it is a fun idea!! Lucky you! Boring, but I'm wanting to add some shade of gray anytime I think I can get away with it. I'm obsessed with oranges and purples right now! Bold colors for me! So much fun! Gosh no current color obessions right now, though I'm always a little low on orange! so cool! Love this idea. I currently am obsessed with aqua. Aqua aqua aqua. With red, with orange, with gray. It's just gotta be aqua! Mustard yellow is my big color obsession right now. 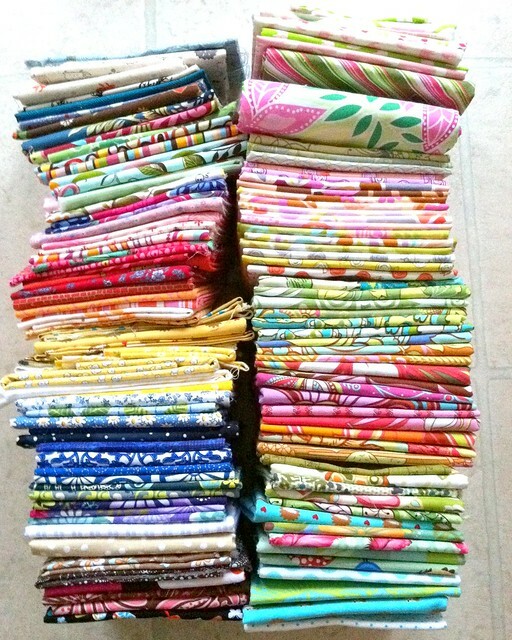 I'm currently in the process of organizing my fabric stash, and I'm making two piles.. one to keep (obviously the MUCH larger one) and one to swap/sell. This will be a great way to not only get new stuff, but to let go of some of my old stuff. I love it! Woops, had to delete my first post. The color I'm currently obsessed with is probably purple, which is funny considering my stash doesn't have a lot of purple in it for some reason. I desperately need to add some blues to my stash, so I guess I am obsessed with blue...any blue. This is amazing! I'm loving aqua, yellow, and gray these days. This is such a fun idea! I always love orange, but right now I'm also really into teal, plum, berry, citron...too much really! It's not so much a color as a composition I'm loving right now. I keep finding that as I pull fabrics to go together for a quilt I pull a bunch of solids and then one or two prints that "pop". I'm loving it! I would love to win this Traveling Stash!! I like all colors, but what I have an abundance of right now are black and red prints, and pink prints. I'd love more small prints too since I tend to buy the larger splashy ones. Wow, this would be so fun to win AND giveaway! I am still in love with yellows, specifically darker, gold yellows paired with either turquoise or grey... yum. Red black and white color combo is my obsession recently. If I had to pick ONE color, it'd probably be teal! I love the blue/green hues that teal can be, and the many color combos! I am into turqoise, teal, blues & purples. Love the idea of the traveling stash. Fun! I've been loving grass green for a whole. I'm obsessed with many many things...but I love a great purple! They are harder to come by than some other colors. Oh and text prints. Can never have enough! raspberry pink and dark grey- it is a tie, and i cannot break it! I've been drawn to pink lately. The Traveling Stash looks so colorful! Ooh, I would love to take part in the traveling stash! I'm loving purple and garnet right now. Being a scrap quilter - all colors work for me, but a clean white to start the palette is delightful. I am addicted to grey and orange combinations right now. Lately I think I have totally been addicted to mustard yellow of all things! a color I normally avoid like the plague! red. Or pink. You know... for Scarlet. :) Cream too. I am totally obsessed with turquiose right now! Turquoise anything! This is such a fun idea! I would love to join in the fun. What a fabulous idea! My favorite color is green but lately I've been gravitating toward tangerine and aqua. Yummy. I am loving citrus colors at the moment. But truthfully I have never seen a color that I did not like! :) There are so many wonderful colors out there right now. I love the idea of this traveling stash! I'm back in love with blues! Thanks for the opportunity to enter the giveaway for the Traveling Stash! How awesome! I am totally in love with blues and greens right now, as I keep sewing up little things for my new little baby. The teaveling stash is such a fun idea! Sure I'd love to play along and pass on some goodies. My favorite color is purple, but I also like yellow lately. I love this idea! I'm currently all over lime greens--just cannot get enough of them! Many thanks for the chance to join in the fun! Great idea! Aqua is my latest favorite color. Just found you and love your writing style! Turquoise is my obsession right now! I would follow the fine print. I'm loving the combination of aqua and red. Turquoise is pretty neat, too. Have a wonderful, wonderful day! Active blogger - check. US resident - check. I promise to fill the box back up with goodies. My favorite color to work with right now is red. If grey counts as a color, then thats what i'm obsessing over :) thanks for the chance! My true love is blue in any form, but what I really need is neutrals. I have been following these boxes from blog to blog in the hope of having it visit my house. I am obsessed with Turquoise! I am obsessed with with pink. Any shade will do. Thank you for the chance to win this. New but active blogger here. Tangerine is what is currently living in my brain and on my sewing machine. I've been following this box around everywhere. I really want to win it, and I'm obsessed with every color EXCEPT pink or orange. I even like that poison green color. You have put a lot into that box! how fun it would be to get the box!!! I love orange - all shades, all values... it's filled with sun and light!!!! thanks. RED - generally with black and white. How much fun this could be - I love to see what other people have in their stash and think sending some of mine along would be alot of fun! Promise... So want to win. I never do though... Oh well. My favs are reds..... Have a great weekemd! I'm ALWAYS obsessed with RED! but, I also love blues and greens. I'm a blogger, I know the rules about filling and hosting the box, too. Sharon V did some great posts about it/them a while back. Oh yes, I live in the USA!!!! The traveling stash is such a cool idea! It'd be like Christmas if it showed up at my house. My current color obsessions include kelly green and that plum/berry color. I have been chasing these boxes all over blog land! LOL. My current colors are gray and orange. Swoon seems to be the pattern of the hour---can not wait to see your version. What a great idea! I'm currently obsessing over so many colors. If I had to pick one, it would be aqua. I'm getting back into blues and lavenders! This is a wonderful idea! I am currently obsessed with orange and avacado green! OK, I have seen these boxes pop up here and there on the Internet and have yet to enter...until now. I just can no longer resist. My current favorite color combo is bright blue and bright green because I'm making a quilt for my mom for her birthday and those are the scraps I've been collecting. Thanks!! Happy belated birthday! My favorite color is pink - bright pink - not powdery pink. With orange a close 2nd. I'm working on Swoon. My blog is at www.piecedgoods.com - come check it out!